Cover: Future location of Olympia Theater in 1904. 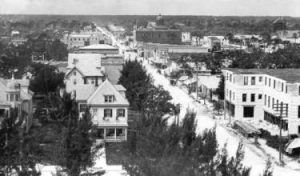 The center of the photograph features the intersection of SE Second Avenue and Flagler Street in 1904. At the time the picture was taken, the corner was referred to as Avenue B and Twelfth Street. The name of the street system changed as part of the Chaille Plan in 1920. The building to the right of the intersection is the Halcyon Hall Hotel. In 1904, the hotel was in its first year of construction. It formally opened on January 20, 1906. The hotel remained at this location until it was razed in the Summer of 1937. The Alfred I Dupont building took its place on the northwest corner of Flagler Street and NE Second Avenue. The southwest corner of the intersection was the future location of the Olympia Theater. The residence on this corner was rented by Dr. James Jackson and his wife in 1897. While sitting on the front porch of this home, Mrs. Jackson looked diagonally across the street and admired the vacant wooded lot. Within a year, the couple bought two lots on that corner. Figure 1: Hippodrome Theater in 1917. The couple built their home on the northeast corner of NE Second Avenue and Flagler Street in 1899. Six years later, Dr. Jackson built his surgical office behind their home in 1905. Both buildings were moved in 1916 when the Jacksons decided to move out of downtown Miami. The buildings were purchased by jeweler H.T. Whaler and relocated to Southside (Brickell Neighborhood). The home stood in the Brickell neighborhood until 2001 when it was demolished. The surgical office still stands at 190 SE 12th Terrace and is used as the headquarters for Dade Heritage Trust. The home that the Jacksons rented in 1897 was replaced with the first Hippodrome Theater in 1913. 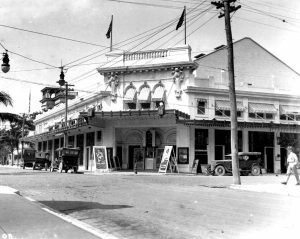 After Dr. Jackson moved his home and office in 1916, the land of both buildings was used to construct the second Hippodrome Theater and office building in 1917. 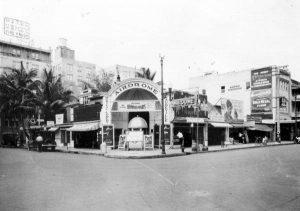 Much like the Jackson family, the theater made a move diagonally across the street to the northeast corner of NE Second Avenue and Flagler Street. Figure 2: Airdrome Theater in 1921. The home of the first Hippodrome theater became the Airdrome Theater in 1918. The Airdome Theater was demolished in 1924 to make room for today’s Olympia Theater. Construction began in May of 1925 and the Olympia was completed in January of 1926. In 1926, the property for the Olympia was owned by Edna Rickmers. She leased the property to Paramont Enterprises Inc for 99-years. Paramont was the builder and original operator of the atmospheric theater and office building. Rickmers was a long time Miami resident and next-door neighbor of the Brickell family dating back to the early 1900s. It was Edna who gave the theater its name. Originally, the building was going to be named the “Miami Theater and Office Building” by Paramont. However, Rickmers suggested that they give it a more appropriate name considering the Mediterranean style architecture. She suggested that they name it the “Olympia Theater and Office Building”. The name of the theater has remained the same since its opening in 1926. Figure 3: Interior of Airdrome Theater in 1921. Cover: Future location of Olympia Theater in 1904. Courtesy of Florida Memory. Figure 1: Hippodrome Theater in 1917. Courtesy of Florida Memory. Figure 2: Airdrome Theater in 1921. Courtesy of Florida Memory. 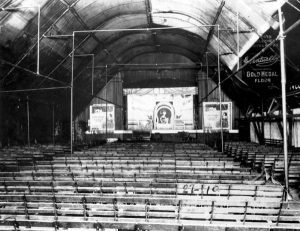 Figure 3: Interior of Airdrome Theater in 1921. Courtesy of Florida Memory.